a. Applicant must Bangladeshi citizen can apply. Every interested student can apply for Jatiya Kabi Kazi Nazrul Islam University (JKKNIU), Mymensingh via two Sytem 1. Online and Mobile SMS System. b. Fill up all information carefully. d. Type the Biller ID 2464 for Jatiya Kabi Kazi Nazrul Islam University (JKKNIU). JKKNIU Admit Card Download: JKKNIU authority 2 November, 2018 to 10 November, 2018 Every candidate published Admit card download time and date their official website http://www.jkkniu.edu.bd/. a. Go to http://www.jkkniu.edu.bd/ and Input your User ID and Password. 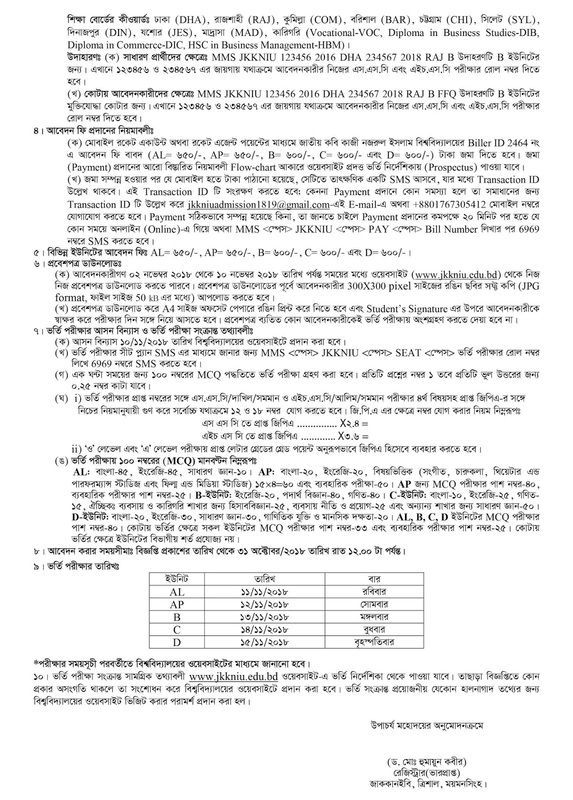 Jatiya Kabi Kazi Nazrul Islam University (JKKNIU), Mymensingh Admission Examination Center and Test Seat Plan will publish JKKNIU official website http://www.jkkniu.edu.bd/ and SMS by applicant mobile at 10/11/2018. 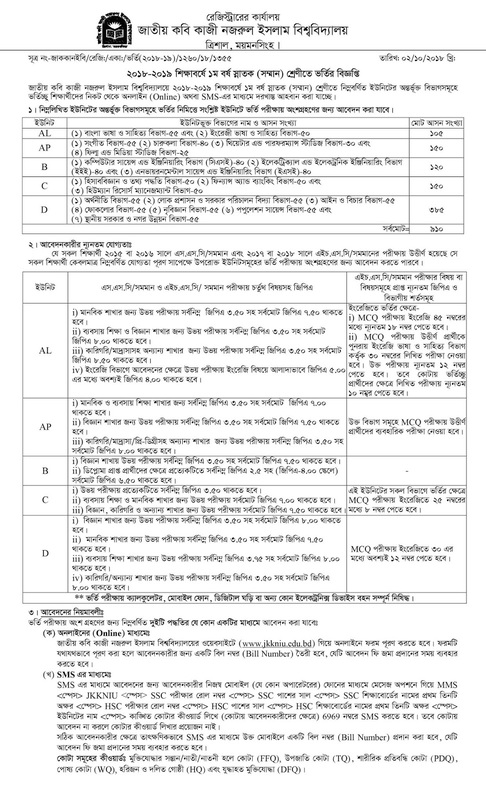 Jatiya Kabi Kazi Nazrul Islam University (JKKNIU), Mymensingh admission result publish as soon as on http://www.jkkniu.edu.bd/ and SMS by applicant mobile. 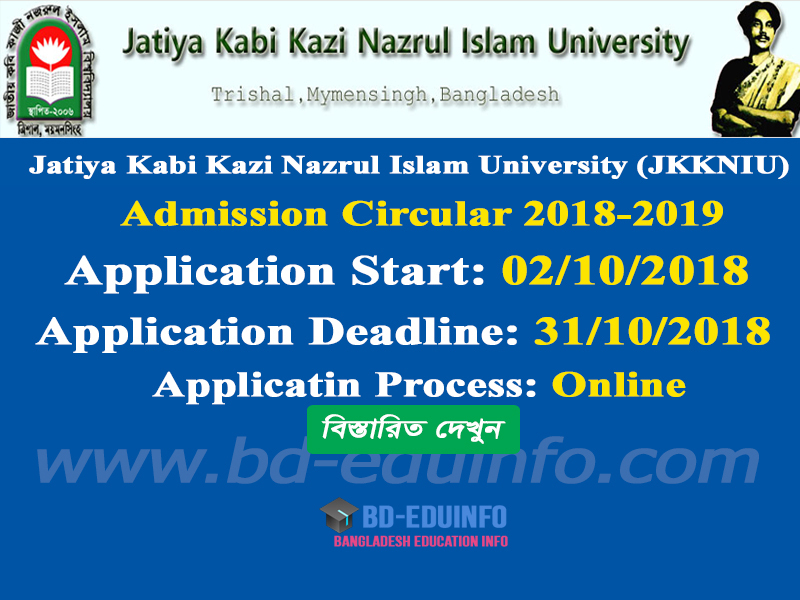 Tags: www jkkniu edu bd admission, Jatiya Kabi Kazi Nazrul Islam University (JKKNIU), Mymensingh Admission circular 2018-2019, Jatiya Kabi Kazi Nazrul Islam University (JKKNIU), Jatiya Kabi Kazi Nazrul Islam University (JKKNIU), Mymensingh Admit card download, Jatiya Kabi Kazi Nazrul Islam University (JKKNIU), Mymensingh seat plan 2018, Jatiya Kabi Kazi Nazrul Islam University (JKKNIU), Mymensingh test mark distribuition 2018, Jatiya Kabi Kazi Nazrul Islam University (JKKNIU), Mymensingh Admission test seat plan 2018.
www jkkniu edu bd admission, Jatiya Kabi Kazi Nazrul Islam University (JKKNIU), Mymensingh Admission circular 2018-2019, Jatiya Kabi Kazi Nazrul Islam University (JKKNIU), Jatiya Kabi Kazi Nazrul Islam University (JKKNIU), Mymensingh Admit card download, Jatiya Kabi Kazi Nazrul Islam University (JKKNIU), Mymensingh seat plan 2018, Jatiya Kabi Kazi Nazrul Islam University (JKKNIU), Mymensingh test mark distribuition 2018, Jatiya Kabi Kazi Nazrul Islam University (JKKNIU), Mymensingh Admission test seat plan 2018.